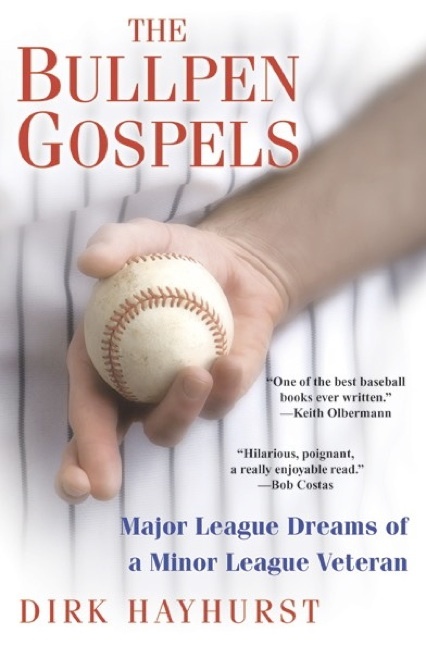 As a someone who will forever have serious aspirations to pitch professionally but will never do so, Dirk Hayhurst’s The Bullpen Gospels: Major League Dreams of a Minor League Veteran certainly stuck a chord with me. It is easily one of the best baseball books I’ve ever read, and Hayhurst’s writing has an amazing ability to transition between hilarious and poignant. The book tells the story of the author and his journey through the San Diego Padres’ minor league system — one filled with failure, doubt, psychological struggle, and ultimately an incredible amount of growth — both on and off the field. For a book that talks for chapters on end of the debaucheries of minor league baseball players — players buying hookers for mentally disabled clubhouse attendants, bus rides spent attempting to get passing cars to flash the bus, and players swinging from lockers exposing their “sacks” to other players’ faces (apparently a common practice), this book ultimately allows the unglamorous nature of minor league baseball to reveal a sense of perspective and clarity — both on baseball and on life. Anybody who has ever dreamed of playing professional baseball should read this book. Check out Dirk’s website and http://www.chrisross91.wordpress.com.